Chuuk (formerly Truk, Ruk, Hogoleu, Torres, Ugulat, and Lugulus) is a group of islands island in the southwestern part of the Pacific Ocean. It is one of the four states of the Federated States of Micronesia (FSM). The other three are Kosrae, Pohnpei, and Yap. 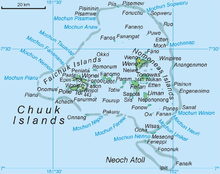 Chuuk has more people than any of the other FSM states. Geographically, Chuuk is also part of the larger Caroline Islands group. This page was last changed on 14 April 2017, at 12:31.